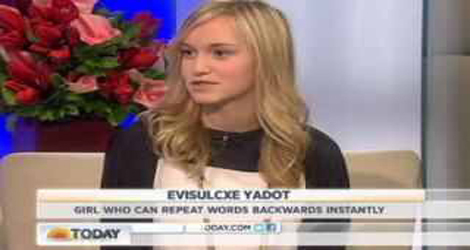 Alyssa Kramer was 14 when she appeared on TV, following a video of her speaking backwards going viral. It’s bizarre. And difficult (yes I have just been sat here trying to do it). When I learned how to read, I learned it both ways. So basically, somebody gives her a word, she visualises it in her head, and just reads it backwards. It sounds easy, but it isn’t. Especially when you see how quickly she replies with the backwards word. Scientists don’t actually know what it is or why she can do it. The thinking is that it is a mental-visual thing, as opposed to memory, but don’t quite know, and currently don’t have a name for it. It’s got no real benefit, besides being impressive, but she could end up being the most obscure rapper of all time if she wanted to be. Assyla uoy etulas ew dna, evisserpmi s’ti.